The Bike Dr's will not be on 21st July and 11 August due to other use of the venue. 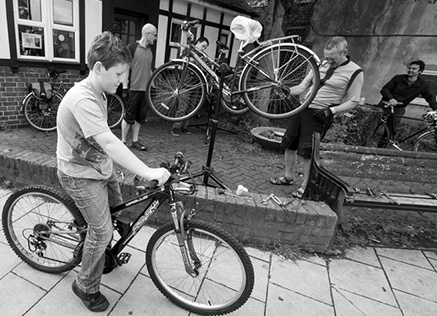 ‘Dr Bike’ is a group of cycle enthusiasts who want to help local people to use their bikes more. If you are not pedalling because of dodgy brakes, stiff gears, rattles, creaks or soft tyres, then bring your poorly cycle to a Dr Bike surgery! We do not offer a fully equipped bike repair shop – Lewes is fortunate to have two of these already – but we do have the skills, tools & enthusiasm to carry out basic repairs & maintenance. We are insured and some of us even have cycle maintenance qualifications! But we are all passionate pedallers who will try our hardest to get your cycle fixed, so you get back in the saddle! In May 2018 we moved to the forecourt of Harvey's Yard. This is (very generously) provided free of charge and all the 'doctors' are volunteers. However, we usually ask customers to reimburse us the price of any parts used and encourage donations in lieu of labour charges. This money pays for any costs we incur including insurance and tools – with the remainder going to a charity nominated by a Dr Bike mechanic. All the ‘doctors’ are volunteers and so our numbers vary, but we usually have 2 or 3 on duty. We don’t use appointments so it’s a first come, first served system. If we are all busy when you arrive, we will either ask you to leave the bike for repair later that morning or, if we won’t have time to fix it that day, then we will ask you to bring it to the next surgery.